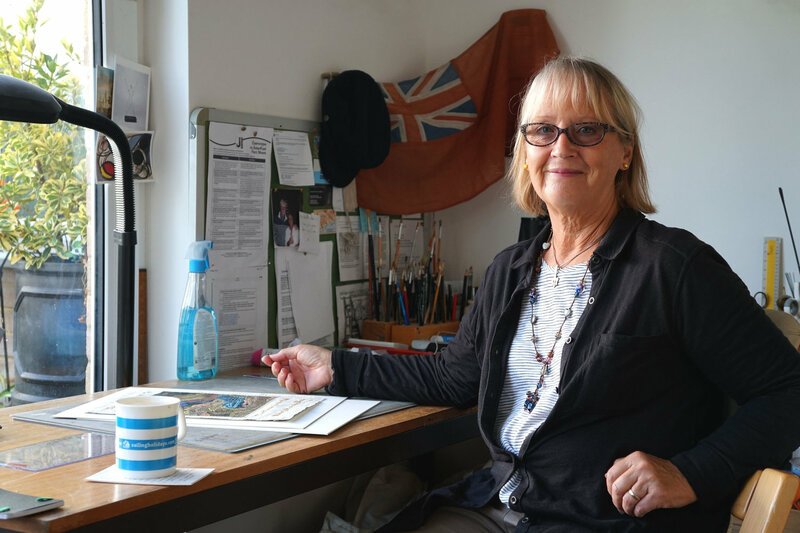 Nicki Vowls is a Deal based artist who takes inspiration from the sea and local maritime history. 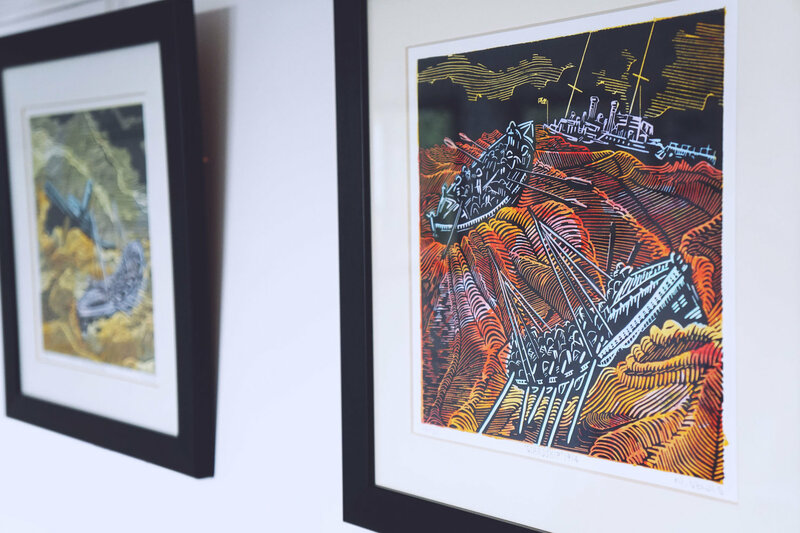 Her wood cuts and lino works are recognisable for their expressive marks and striking nautical scenes. We spoke to Nicki about her background as a teacher, her life as an artist and the process behind her works. 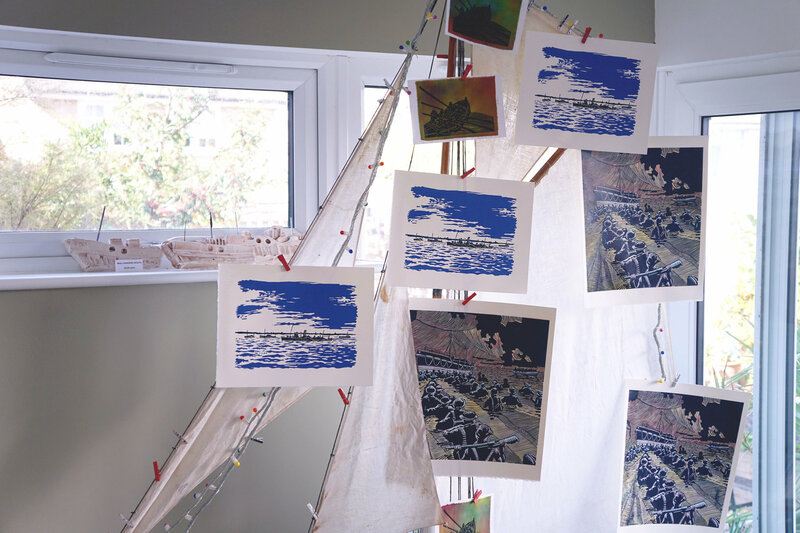 How did you get into printmaking? Well I did printed textiles while I was at college, I went to art school in Camberwell and I did screen printing and a bit of lino printing. But when I started doing this here in my house I didn't have the room or the implements to do screen printing. Lino cutting is quite nice self contained little thing to do. Are you from Deal originally? I’m from Greenwich, and I went to Camberwell school of art and did my foundation and then degree there. I then went to Goldsmiths for a year to do teacher training, straight away I became an art teacher at secondary school in New Cross. I taught there for 13 years I think it was, I only ever intended to just do it for a year, but it was just really nice I loved it. Teaching in New Cross was just getting a little bit tough and I wanted a new start. I saw a cafe for sale in Ramsgate just above the harbour, bought it and did that for a year and then sold it because it wasn't my dream. I had ideas of it being nice and relaxing after teaching and it never worked out, then I saw a job teaching art in Canterbury, I was head of art at Barton Court School. I really enjoyed it, then five years ago I thought it’s time for me now, so I stopped teaching and started doing this. We always wanted to be in Deal because it's such a lovely place and what we really wanted was to live on the sea front. But that was expensive and there weren't any houses on the market. And then this place came up, it was a knackered little ugly duckling and we thought, we could make a go of this. Do you find you’re particularly inspired by the sea? How do you work the historical stories into the work? Well I start with a story, and I do a lot of research into that, they're mostly local about Deal. Some of these ones behind me are local ships that went across to Dunkirk, that ones the Walmer lifeboat. The Deal Maritime Museum has got fantastic resources to help sort of investigate those stories. It usually happens where I’ll come across a story, and I research the history of it a little. I find that very enjoyable and it helps you get your thoughts straight about what you want to do. Then I’ll look at the boat on the internet, you can type in SS Niger 1914 and get all the images up of what the ship looked like. Then I start playing around with drawings cutting them out and pasting them to make a nice composition. I will have drawn the boats and then arranged them so the perspective was right for the mountainous seas and then I’ll have to think of a colour. How did you become involved with South East Artists group? When we moved to Sandwich and I was teaching we used to visit the open houses and I used to walk round and think, I’ll never be good enough so it was sort of aspirational. When we moved to Deal and I stopped work I just contacted someone and found out about it. Were you apprehensive at first? Very! I thought I was going to have an interview like at college to join but it wasn't like that at all they were just happy for me to join. We all know each other very well now and I do open studios every year. From that I get contacts and customers who just keep coming back which is really nice. In a couple of weeks time we’re joining East Kent Open Houses https://ekoh.org.uk/ which is a new and it’s part of the Canterbury festival. We're opening our houses in October for 3 weekends hopefully it will bring people in from different areas. How did you get into making these models? 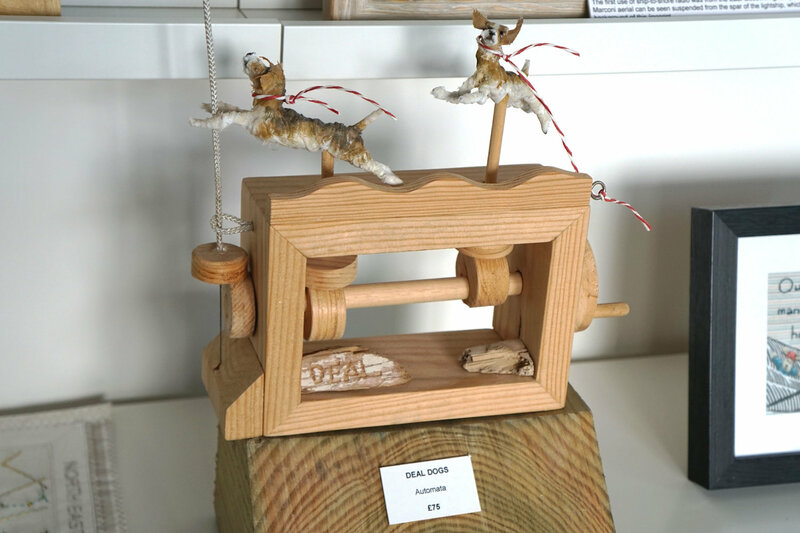 They’re little automatas, I’ve made loads of them and they’ve been really popular. It started with just Deal images, like boats and I graduated to the dogs we see from our window on the promenade. Just watching the dogs you get to see all their characters through their expressions, looking up at things and dreaming. They're made out wire and I’ve wrapped them with bits of torn old sheet, I can sculpt them and it just happens. We've got a small area in the garage where I do the woodworking for them. Do you draw or paint much or is it mainly printwork? I do a lot of drawing its one of my first loves really, and painting I don't really do a lot of but I want to concentrate on it. This is all going really well at the moment so I’m in this, but I’m looking forward to doing some more painting and mixed media. Have you got any tips for anyone wanting to start out in art? Always go further than you think you should, when I was teaching students they were always happy to stop when something was ok and I think lots of people don't take risks and you don't learn unless you push it and make a mistake. We like the Hythe Fish restaurant in Dover because it looks out over the harbour. If you book it you can get a window table, you’ll got the most amazing view particularly in the winter at night when all the ferries are coming in. We go up to the White Cliffs Visitors Centre in Dover and do some very nice walks.